Picture - Aeroflot MP-1 at Yalta, circa 1938. The MBR-2 was designed by Georgy Mikhailovich Beriev and first flew in 1931, powered by an imported 373 kW (500 hp) BMW VI.Z engine. Production models, which arrived in 1934, used a licence-built version of this engine, the Mikulin M-17 of 508 kW (680 hp), and could be fitted with a fixed wheel or ski undercarriage. Beriev also designed a commercial airliner derivation, the MP-1, which entered airline service in 1934, and a freighter version, which followed in 1936. In 1935, an improved version was developed, the MBR-2bis, powered by the Mikulin AM-34N engine, and fitted with an enclosed cockpit, dorsal gun-turret and enlarged vertical tail. In this configuration, the machine remained in production until 1941. As with the MBR-2, the bis spawned a commercial derivative and the MP-1bis entered service in 1937. MBR-2M-17 : Short-range maritime reconnaissance, bombing flying-boat, powered by a 508 kW (680 hp) Mikulin M-17B piston engine. MBR-2AM-34 or MBR-2bis : Improved version, powered by a Mikulin AM-34N engine. MBR-2M-103 : One MBR-2AM-34 was fitted with the more powerful M-103 engine. One prototype only. 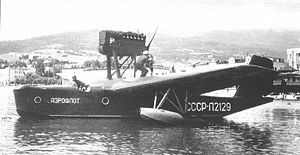 MP-1 : Civil version of the MBR-2M-17 flying-boat for Aeroflot. It could carry six passengers in an enclosed cabin. MP-1bis : Civil version of the MBR-2AM-34 flying-boat for Aeroflot. MP-1T : Freight transport conversion of MBR-2. The Finnish Air Force operated five captured aircraft from 1941. Munson, Kenneth (1969). Bombers, Patrol and Transport Aircraft 1939-45. Blandford. ISBN 0-71370379-2.